US GOVERNMENT SCIENTISTS have agreed that all but 50 of hundreds of chimpanzees kept for federally funded research should be retired from labs and sent to a national sanctuary. The proposal from a National Institutes of Health committee also said all of the chimps should have plenty of room to play and climb. The NIH Council of Councils Working Group on Tuesday approved the proposal, which also calls for major cuts in grants to study chimps in laboratories and no return to breeding them for research. Already, nine chimpanzees arrived Tuesday at Chimp Haven outside Shreveport, Louisiana, from the University of Louisiana at Lafayette’s New Iberia Research Center, which no longer has an NIH chimp research contract. Seven more are expected today and another 95 will arrive over the coming months, sanctuary officials said. The federal agency said in 2011 that it would phase out most invasive research on chimpanzees. The new 86-page recommendation describes how chimpanzees should be kept and what will be needed for any future research. Chimps should be used only if there is no other way to study a threat to human health, and the research should be approved by an independent committee with members from the public, said the Council of Councils proposal, which will be sent to the NIH’s director after a 60-day public-comment period. Animal-rights activists said they were pleased by the recommendations. “At last, our federal government understands: A chimpanzee should no more live in a laboratory than a human should live in a phone booth,” the People for the Ethical Treatment of Animals said in a statement. Chimp Haven was created on 200 acres of a Caddo Parish park in Keithville in northwest Louisiana. “We should see more than 300 chimpanzees getting moved to the federal sanctuary system,” said Kathleen Conlee, the Humane Society of the United States’ vice president for animal research issues. But Conlee said she was disappointed by the recommendation to keep a group of about 50 in case further research on chimpanzees is approved. “But I’m glad they made clear those animals should be kept to much higher standards than they are currently being kept in,” she said. Chimpanzees should be kept in groups of at least seven, with about 1,000 square feet of outdoor space per chimp — roughly one-sixth of an acre for a group of seven, according to the proposal. The space must include year-round outdoor access with a variety of natural surfaces such as grass, dirt and mulch, and enough climbing space to let all members of large troupes travel, feed and rest well above the ground, and with material to let them build new nests each day, the report said. Chimp Haven’s enclosures range from a quarter-acre to five acres, some of them forested and all with climbing structures. The announcement of its first animals from the University of Louisiana at Lafayette’s New Iberia Research Center was delayed a day to keep stress on them to a minimum, officials said. “Understandably, the chimpanzees are nervous when they arrive, and we do everything possible to ease their stress. That includes limiting the number of people in the area to only those who are required to help with the chimpanzees. We also must minimise the risks of the chimpanzees being exposed to communicable diseases,” veterinarian Raven Jackson said in the news release. A $30 million cap on total spending for construction and care of Chimp Haven’s retirees has been looming. That would stop NIH from contributing 75 percent of the $13,000 annual cost to care for each federal chimpanzee. Conlee said the Humane Society will urge Congress to move money now spent on research contracts to Chimp Haven. The sanctuary gives the animals better care for less money than the labs are paid, she said. The site of ‘Chimp Haven’ in August 2004. 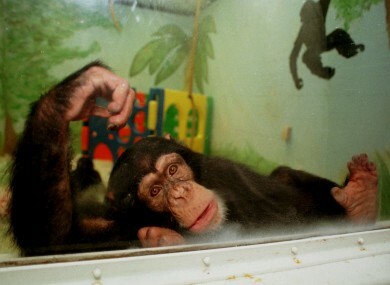 AP Photo/Chimp Haven, Naomi Lopez-Bauman. Email “Research chimpanzees to be 'retired' in the US”. Feedback on “Research chimpanzees to be 'retired' in the US”.